Buckeye Valley’s Zach Kreft poses for a picture during his time in San Diego for the Foot Locker Cross Country National Championships. Buckeye Valley’s Zach Kreft accomplished more in his first three years of high school cross country than most do in four. He’d already won a state title and set more than a few records … he’d already had a monster career. There was one monster left to slay, though. He wanted to compete for a national championship and, after nabbing his second straight OHSAA Division II state crown last month at National Trail Raceway, Kreft earned a chance to do just that. 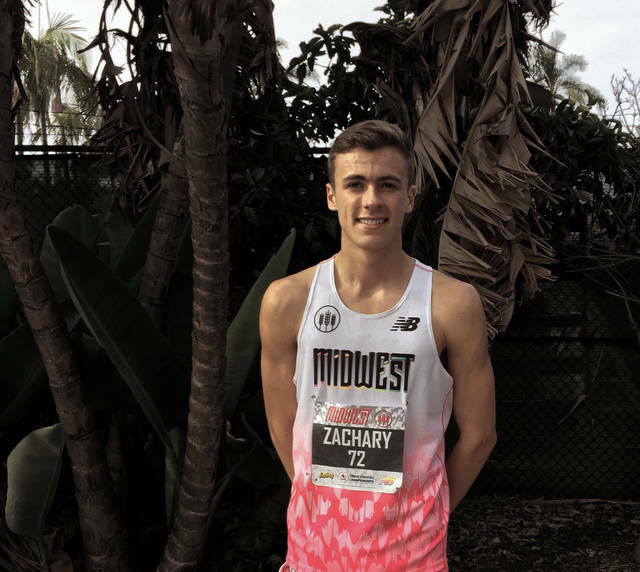 He finished second in the Midwest Regional Championship on Nov. 25 — an effort more than good enough to punch a ticket to Saturday’s Foot Locker National Championships at Balboa Park in sunny San Diego. Kreft finished 12th overall — not the finish he was looking for — but said he walked away with an experience he’ll never forget. “This has been one of the best weekend’s of my life,” Kreft said. “I can’t thank Foot Locker and New Balance enough for putting on such a great meet. My experience was outstanding … I loved it. It almost felt surreal being there, especially when athletes like Emma Coburn (bronze medalist and two-time Olympian), Cory McGee or Brenda Martinez were just hanging out with us. Kreft was just two seconds behind the lead pack a mile in, but ran into some trouble after that. He rebounded well, though, crossing the finish line in 15:48.2 to narrowly miss a spot in the top 10. “The race itself was OK,” Kreft said. “I didn’t get out where I wanted to be right away and was forced to battle for position in the mid-pack. Unfortunately, around 1,200 meters into the race, I got shoved down and spiked on my lower back. Buckeye Valley coach Nate Ritz made the trip to California as well. He simply couldn’t miss the chance to see Kreft compete one last time. Next up, Kreft will compete on the Baron boys track team in the spring before heading off to Notre Damn to start his collegiate career.